With its squares, mansions, oak trees and Spanish Moss, Savannah is a gorgeous city when you’re standing on the ground. But how does it look from the air? To find out, we got in touch with Old City Helicopters, who invited us out on a sunset tour. 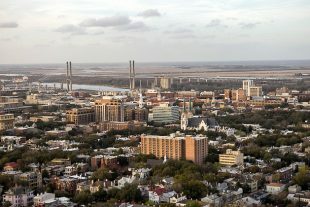 Soon enough, we were zooming along the Savannah River, looking down upon the city from above.